Submitted by Fuseblower on May 21, 2012 - 1:51am. I would have thought that riding it in flames constituted quite a risk! Submitted by Nira on May 21, 2012 - 5:50am. Kudos to you two for finding a way to crash-burn a bicycle! That last panel is just priceless. Submitted by The Owengineer on May 21, 2012 - 3:39pm. 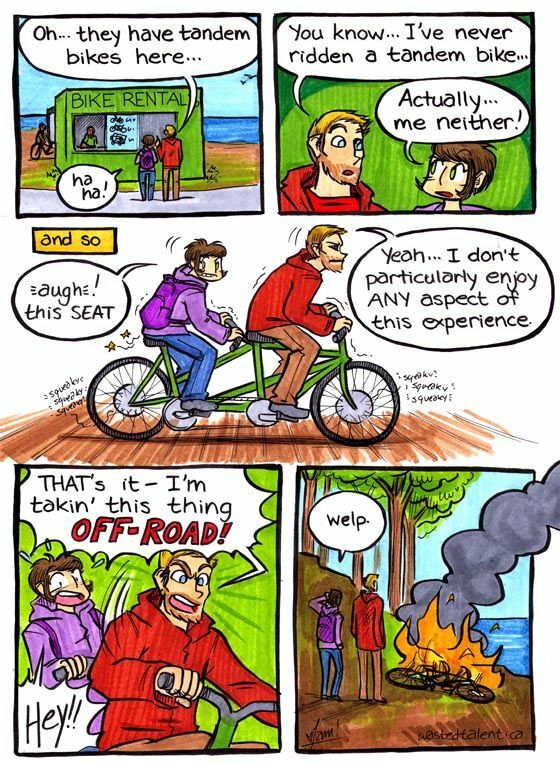 My engineer's brain is not allowing me to laugh at this comic; it's too busy asking questions like, "How does the increased length of a tandem bike affect its stability" and "How would a theoretical tandem where BOTH people could steer work?" And now I'm off thinking about the trigonometric principles of stretch limo drivers turning tight corners. Why do you do this to me, brain? Submitted by Fuseblower on May 22, 2012 - 3:17am. I understand exactly what you mean - but despite being an engineer myself, I'm with Nira on this one! Submitted by The Owengineer on May 25, 2012 - 4:26pm. Oh, fine, I'll agree; fire IS pretty cool. Submitted by AletheiaAgape on May 23, 2012 - 9:01pm. Submitted by The Owengineer on May 25, 2012 - 4:22pm. Oh lordy, those BANKS! That's got to be a forty-five degree angle on those turns! And at THOSE speeds you can sure bet a bike'd catch on fire during a crash. Nice find, Aletheia. Submitted by barefoot on May 26, 2012 - 8:18pm. The word "tandem" in the dialog can be replaced by "rental" and the story rings just as true. A reasonable quality bike that fits is a wonderful thing. Rentals are neither of these things. A reasonable quality tandem bike that fits is a wonderful thing. Rental tandems are neither of these things. Burn rentals, not specifically tandems. I think we lasted about five minutes before Trevor decided there wasn't a high enough risk of death.